Switching your search engine is not something to be taken lightly – it’s our internet lifeblood. We rely daily on algorithms we don’t understand to surface the exact article we’re looking for. And if for some reason it’s not at the top of our results – even if the search we entered was a half-baked string of words – we get frustrated. Luckily, in 2018, Google has put most of those frustrations to rest. But now that search seems to be in a “steady state,” it gives us some time to consider what else is out there. These past two weeks, I did something that 15, maybe even 10 years ago, may have been inconceivable: I gave other search engines a go. First, I tried the privacy-focused, ad-blocking DuckDuckGo. The next week I moved to Microsoft’s Bing, something I never thought I’d hear myself say. The move off of Google wasn’t as bad as I imagined when first taking on the task. 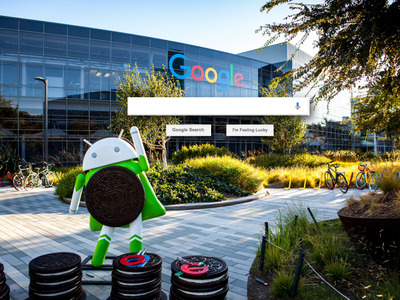 It amazed me that other companies are now competitive with Google when it comes to search. HOMEPAGES: The Google Doodle is hard to beat. 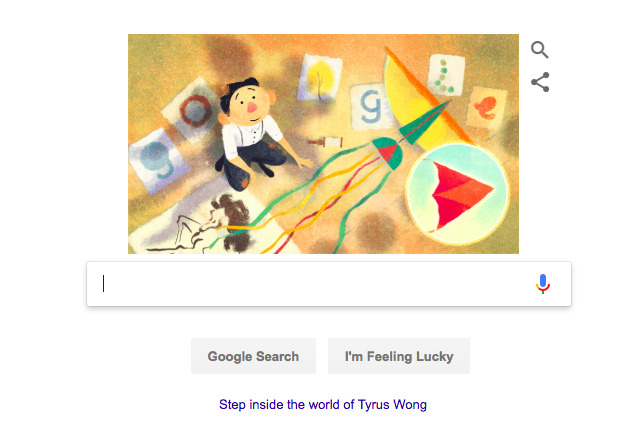 Most days, Google offers up a new illustration that’s often significant to that day. On this particular day, I learned about the Chinese-American artist Tyrus Wong who worked on Disney’s “Bambi” and lived to be 106. Also available to click on (though I haven’t in years) is the “I’m Feeling Lucky” button. Clicking this button will pull up anything from a list of trending restaurants to a quick game of solitaire – sort of like Google’s version of the website Stumble Upon. 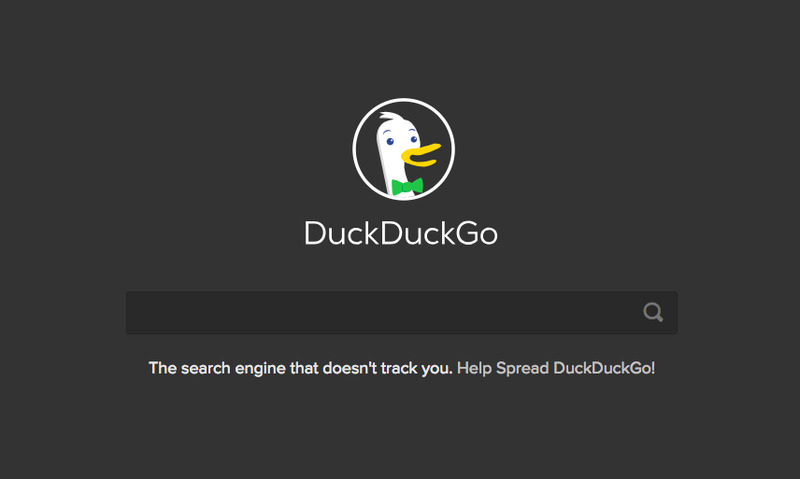 The homepage for DuckDuckGo is pretty much barren. The only call to action is to click on the text box and start typing. 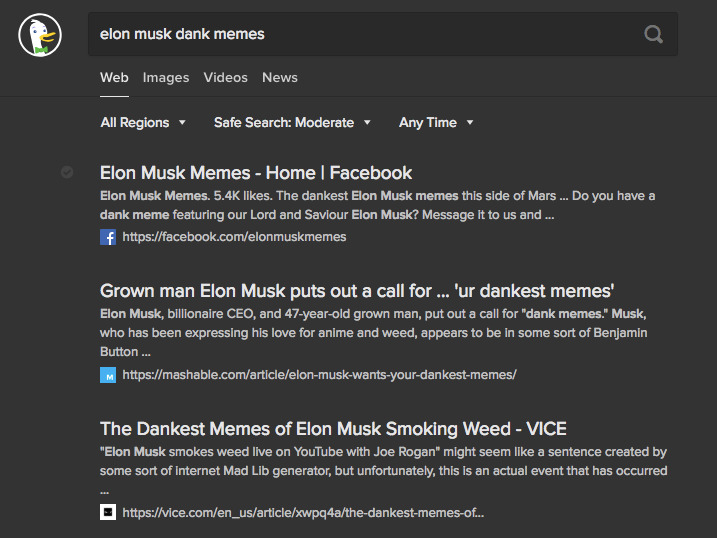 DuckDuckGo does make changing themes quite simple if you’re looking to mix things up a bit. I chose to go Dark Mode. Instead of illustrations, Bing decided to go with daily photographs around the world, often of beautiful landscapes presumably meant to inspire. Bing also provides some thumbnails at the bottom of the page of “trending” news stories. The headlines were typically catchy, and I was often tempted to click. Below the fold, there are lifestyle stories, homepage photos from recent days, and a timeline of notable events that happened on that particular day in history. Bing’s homepage is easily customisable, so you can get rid of this news feature and the photography if you want to focus on search. LAYOUT: When it comes to searching for news, Google does the best job of surfacing top stories and making them clearly defined in its design. Here, I searched for “Elon Musk dank memes” (based on the Tesla founder’s recent tweet) and was given top stories at the top, images of said “dank memes,” and then a list of articles in typical Google fashion. If I would have simply searched “Elon Musk,” the layout would have looked different with a bio box on the right-hand side that links to images of Musk, thumbnails of his recent tweets, and a “People Also Ask” box – i.e. “What is Elon Musk’s IQ?” (it’s estimated to be 155, by the way). In general, Google’s layout does the best job of any search engine of creating sections for information, making it easily accessible and digestible. 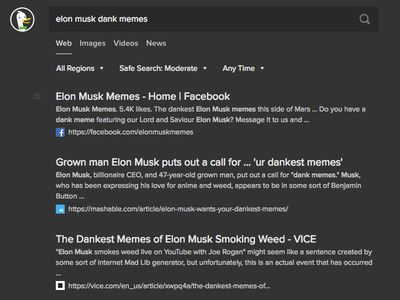 DuckDuckGo simply returns a list of search results, without sectioning off information. The layout here is simple and can be aesthetically pleasing, but I found the list approach took me much longer to seek out the articles I was looking for. I do appreciate how DuckDuckGo includes the publication’s logo in its search results, similar to the logos that appear in tabs at the top of a browser. That helped me more easily identify which publication the piece was coming from. 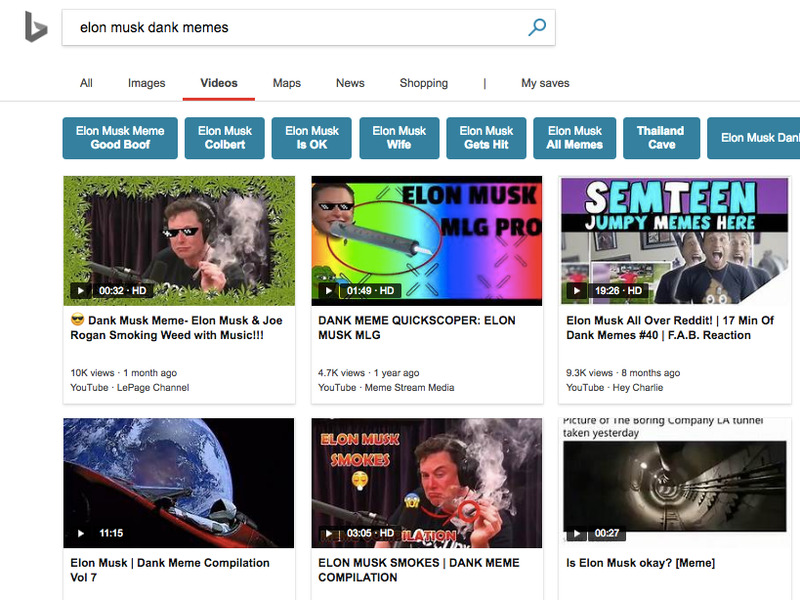 A search for simply “Elon Musk” in the privacy-focused search engine does return a bio on the right-hand side and recent news thumbnails at the top, but it focuses primarily on a list approach rather than creating sections. Bing’s layout is essentially the same as Google’s, with one exception when it comes to videos. When using Bing, I couldn’t help but wonder what was legally permitted when it comes to copying another company’s design choices. Bing is almost an exact replica of Google when it comes to design, which may be a surprise to anyone who hasn’t tried Bing in years. It was for me, anyway. The main difference is in video layout. Whereas Google still lists its videos, Bing presents videos in square tiles. On some videos, it even allows you to preview the video by hovering, rather than having to click in. It should be noted that DuckDuckGo took the same approach to videos as Bing. SEARCH RESULTS: Google is the gold standard. When comparing search prowess, the question is: Can any other search engines stand up to Google? Google is continuously indexing search results and getting smarter with the information it serves you. It can also handle direct questions perhaps better than any search engine out there and elegantly surface that information. I asked it, “How many calories are in a Big Mac?” and boom: the answer is 563. DuckDuckGo felt limited in the results it provided. There were a few times when searching for articles that it only provided a couple of pages of results, but perhaps those were the most relevant. Still, even though I’d rarely ever go past the third or fourth “O” in “Goooooooooogle,” it’s nice to know you have options. 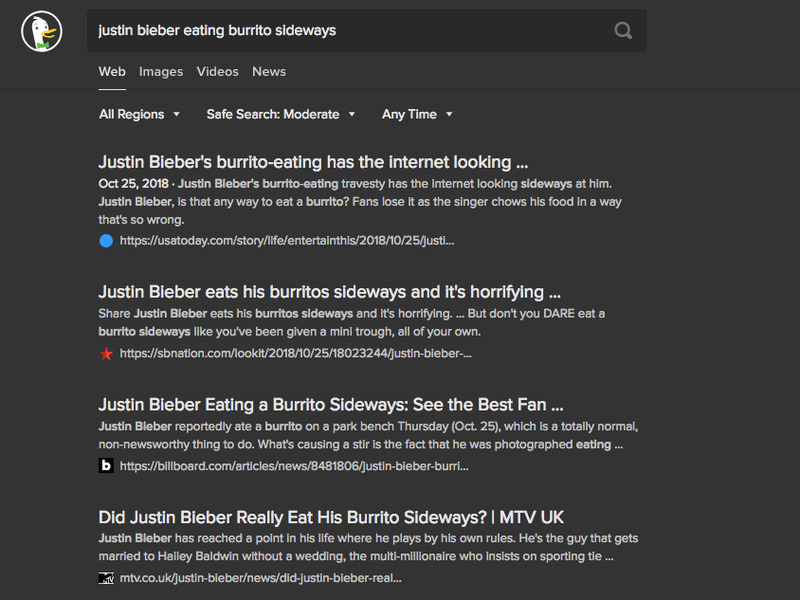 I can’t dock Duck Duck Go too hard for its limited results, though – for a search of “Justin Bieber eating burrito sideways,” there were countless pages of results. Bing was pretty much on par with Google, which was a big surprise. I did not notice much of a difference at all in search quality when switching to Bing; the results were pretty much identical. There was one time when I needed the email address of an Apple PR person for a story I was working on. A quick search for “Apple press” in Bing returned red apple presses (or crushers) to make apple cider. I thought “stupid Bing” to myself as I went to Google to compare the results. 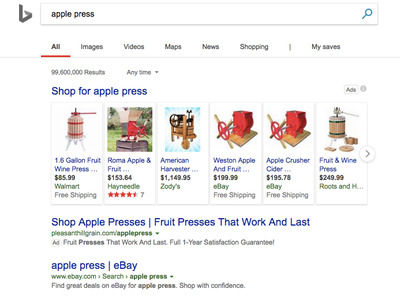 Google returned the same red apple presses. I then thought “stupid me” and added an “Inc.” after Apple. UNIQUE FEATURES: The competition has copied most of Google’s quirks, but its default applications are still superior. It’s hard to find features 100% unique to Google, because as the industry leader, competitors like are often quick to copy. But there are still a few features that make Google, Google. Type in “sunrise,” for instance, and you’ll get the exact time the sun will rise in your city. Type in a tracking number, and you’ll get a quick link to find your package. Another aspect that sets Google apart is being able to use its applications like Google Maps and Google Flights by default, which, for me, are superior to what the competition offers. Privacy is the main selling point for DuckDuckGo. The Google search alternative doesn’t track your search history, the time or location of your search, or your IP address. However, I didn’t feel the privacy features at work a ton in my day-to-day usage of the product. Typically, privacy isn’t an issue until it’s an issue. One cool privacy feature was the ability to see the number of ad trackers blocked on each website I visited. 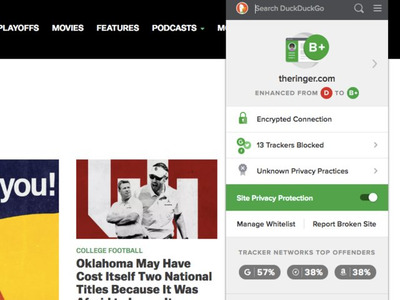 On theringer.com, for instance, DuckDuckGo was able to block 13 trackers for me. Some buzz has been generated by DuckDuckGo’s “bang” feature – essentially, keyboard shortcuts to top sites. Search for “a!” and it takes you to Amazon, while “yt!” takes you to YouTube. I didn’t find bangs particularly useful, as saved searches from your drop-down menu accomplish a similar, quick result without having to remember the actual shortcut. Bing offers Microsoft Rewards points every time you search. Most of Bing’s unique features are shortcuts you would find on Google, like the sunrise trick or the unit conversion tool. 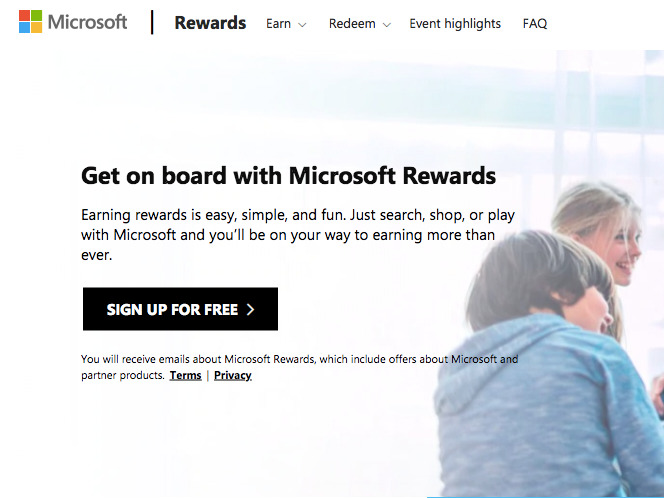 But one exciting feature used to incentivise usage is that every time you search on Bing, you earn “Microsoft Rewards” points. Like a credit card rewards program, these points can be redeemed for things like Amazon or Starbucks gift cards. They can also be used to enter sweepstakes – like to win a 1 terabyte Xbox One X console – or donate to organisations like the Special Olympics. Search on Bing via the Microsoft Edge browser and earn double the points. THE VERDICT: Others may be catching up, but Google is still on top. Crowning Google as the best search engine available might not come as a surprise, but I was shocked that it was even a competition. Others are definitely catching up regarding search prowess and usability. 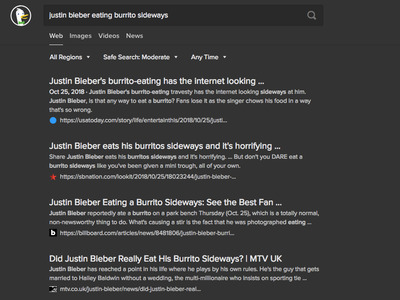 Bing has made a valiant effort to keep up, but it would need to innovate on search somehow – rather than merely copy Google’s design choices – to be on top one day. If privacy is a top concern, DuckDuckGo is a solid choice. Its search results are comparable to Google, but its minimal design and list format may slow you down a bit. 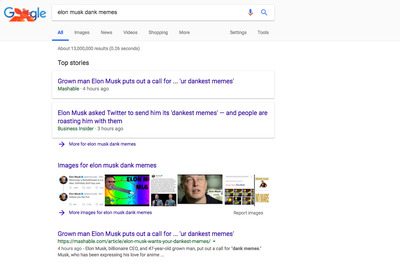 Love it or not, Google still provides the best search experience and delivers the best results. It may be tracking my every move, but for now, I’m hooked.